I'm a total teal whore. I don't even care. My favorite color for the last 23 years has been cerulean blue, but I think teal is slowly eeking its way into Favoriteville. 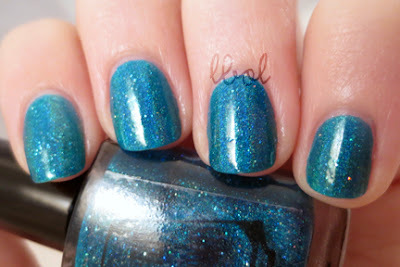 This is another one of those polishes that I've kept on my wishlist for a while now. Why didn't I just buy it as soon as I saw it? 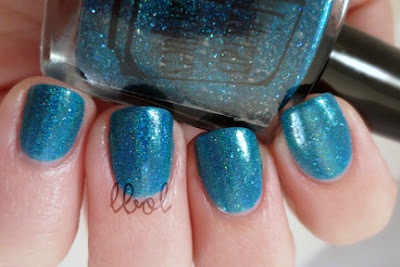 PGGB is the most unngghhh bright teal jelly with a mild linear holo and tiny holo glitter. I need need need need need need need to find a light for my light box that does to holo what sunlight does to holo. Is there such a light? I'll find out, guys, it's okay. This is 3 thin coats. Essie G2G on top. Artificial (not holo-friendly) light. The last one's with flash, for good measure, obvs. I need more Literary Lacquers in my life.